LAS VEGAS — For some enterprise IT shops, migrating to the cloud has always been a no-go because of the psychological barrier of not being able to see the server hosting your data firmly planted in a rack on your own soil. Well, now Amazon Web Services (AWS) even has an answer to that. AWS Outposts will allow enterprise customers that require on-premises infrastructure to run AWS cloud infrastructure in their own data centre. Customers of the new service, announced on Wednesday at AWS re:Invent, will have a rack with the same hardware that AWS uses in all of its regions. Customers will have two options to manage this “on-premises cloud” infrastructure – either VMware Cloud on AWS, or AWS native instances. 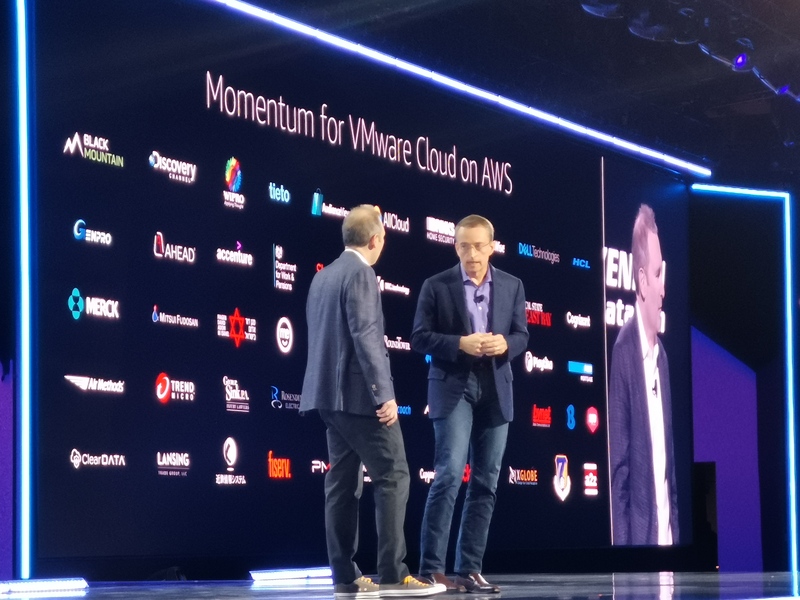 AWS CEO Andy Jassy announced the new offering on-stage alongside Patrick Gelsinger, CEO of VMware Inc. “You’ll be able to run software on that, starting with the VMware software, that allows you to manage your presence on-premises and across the cloud,” Jassy said. VMware is not only offering the VMware Cloud on AWS Outposts option, it’s also building integration points into its other products that will support the new form of infrastructure, Gelsinger said on stage. AWS CEO Andy Jassy and VMware CEO Pat Gelsinger on stage at re:Invent. The announcement may be a tacit acknowledgement by AWS that enterprises will never fully abandon on-premises infrastructure to operate fully in a public cloud environment. Working directly with VMware to offer customers convenience in managing their workloads across on-premises and public cloud could initially be explained as a step in the migration process. But now with the full commitment to managing cloud infrastructure on customer’s soil, it’s clear AWS has joined the growing consensus that hybrid cloud is the dominant operating model for enterprise. While AWS has been working closely with VMWare since 2016 – offfering customers the VMware Cloud on AWS option – and VMware was present at last year’s re:Invent conference with a booth in the expo hall, as well as sessions, there was no talk about the collaboration in keynote presentations. But it seems the relationship is no longer low profile, Mueller says. Whatever the industry politics implications, Athabasca University CIO Jennifer Schaeffer is just excited to get her hands on Outposts. During the keynote, she was hammering away on her smartphone, writing emails back to her team about the potential it offers. Her team, running a shop for an Alberta university known for its remote education offerings, is invested in both AWS for public cloud and VMware’s stack for on-premises. It’s customers like Schaeffer that convinced AWS find a way to deliver an on-premises solution, Jassy said in a press conference. They want to be able to run certain AWS workloads in their own data centres, but that will still integrate with the rest of their applications in AWS. Jassy didn’t actually utter the words “hybrid cloud,” but it sure sounds like that’s what he’s describing. Currently, Amazon is offering sign-ups for those that want to learn more about Outposts. There’s no timeline on its availability.